Ah ministry failure…something you and I are more familiar with than we care to be. In today’s episode, we’re showing you how to deal with ministry failure, learn from it, and retain your volunteers even after everything goes wrong. Today’s show is a special clip from our CTA Insiders Mastermind Group Coaching. Justin typically shares a short training session during our bi-monthly masterminds, and in our previous mastermind Justin shared something close to his heart, ministry failure. And as it turned out, Justin was under the weather during our recording time, so we decided to share this Insider training with you for our show. A disagreement I get into often is the future of college. I believe that higher education is going to look different in 10-15 years. Right now you go graduate high school, get easy loan money from the government, and then you hopefully finish college to go into the work field. 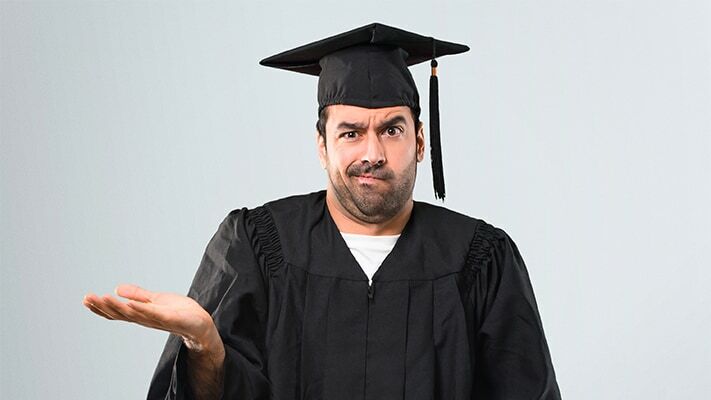 The problem is many kids seem to find out after graduating that their field of study isn’t what they want to do with their life, they can’t find a job in their field, or they stay going to school because they just don’t know what they want to do yet. I personally fall into the former. Almost one-third of college students change their majors. While my wife and I were talking about my daughter’s college plans (yes, we’re starting while she’s 5), we reflected on our own college journey. My wife studied premed biology. But by the time she graduated, she was burned out on school, and instead of applying for medical school, she went right into the workforce. After a few years of working in a hospital lab, she discovered she didn’t even want to be a doctor! After being able to figure out what she really loves (patient care and interaction), she’s discovered becoming a physician assistant would better suit her life’s mission and passion. There are many others that go to college because they’re told they have to. It’s expected of them, or they’ll be flipping burgers at McDonalds. I myself was told the same thing. So when it was time to pick a college and degree, I was herded into the church music field. I say this with no bitterness towards the people around me at the time. But I had surrendered my life to ministry, and I was good at music, so naturally everyone encouraged me to study music. I am very thankful for my degree, but if I had a little more time to play and test with different career options, I might have majored in something different. Myself and other young people were pressured to make a decision during high school, a time when we were still developing and discovering the world. In addition, there were certain standards in place to deem us “good students.” We had to memorize facts like presidents and do math without a calculator…all things rendered pointless because of the phone in our pockets. What we’ve done is taken standardization and memorization in school and make those the key indicators of success instead of critical thinking. Kids who are taught critical thinking are more successful in life. School is about memorization and passing tests, but not so much practical things like financial responsibility, mental health, time management, or discernment. No, we are measured on our ability to memorize facts and figures and are graded on our ability to spit out answers. But that’s not what helps us succeed in life, it’s critical thinking. 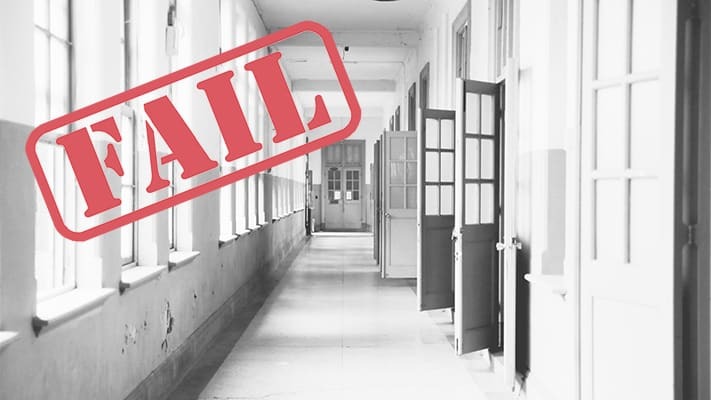 It’s thinking under pressure, adapting, modifying our approach, learning from our mistakes…attributes you don’t learn in a typical school experience. And if you look at the most successful people, they are really good critical thinkers, and they are able to move past failure. This is where school has failed us. We don’t know what failure is because if we get a failing grade, we get another shot in the next grading period. And many schools give more assistance to move past failure like tutoring or extra credit…opportunities that don’t naturally present themselves in life when we overdraft, apply for a mortgage, or experience a death in the family. When I was growing up, C-letter grades were the equivalent of failure. I made two Cs my entire high school career, and I was grounded for 6 weeks each time. Failure was not an option in my household, and because of that, I was afraid of failure. And to this day I am still afraid of failure. And when I do fall short and fail, I don’t know how to cope with it. When the going gets tough, I tend to choose to not try. And you’ll find this in any generation. We were all told if you just put your head down and stick to the facts and what we tell you, you’ll be successful in life. But life is WAY MORE than just knowing who the presidents are. We don’t learn basic life skills like banking in school, and we even only got one semester of health class! As a result, we only choose to do something if we know we can do it. We take the easy road…we’ll stream to Facebook because that’s easy. But when asked to try and stream to another platform…we hesitate. That’s harder, it costs more money, and if we try we might fail. So, maybe we’ll just stick to what we know. Or maybe we find some documentation of what worked for someone, and we try it ourselves. Bu if it doesn’t work, we fail and shut down. We don’t know how to critically think outside of what we were told, so when it doesn’t work we don’t find our own solution. In church media, our volunteers may be in the same boat. They may not have the critical thinking skills you want them to have. Or you yourself. They’re fine clicking buttons and changing settings as trained, but if something goes wrong and they have to start problem solving, it gets tempting to quit. As part of your church media training and continuing education, challenge your volunteers to critically think. And let them fail. This is where it gets hard as leaders because we want our people to succeed, and we can sometimes skew projects and goals to take failure off the table. I was allowed to take on a lot of responsibility when I was a youth intern. And as a result, I planned some terrible games, bad Bible studies, sang some crappy songs, and played a lot of wrong chords. But through all those failures, my boss and youth pastor coached me through what didn’t go well. He wanted to use these events as a learning opportunity. He showed me where I failed, what I didn’t plan right, how I dropped the ball, how I got too frustrated or too stressed…he helped me find the things that made me uncomfortable and challenged me to be better. When you’re building up your own church media team, you want to look for critical thinkers. But not everyone has been raised that way. You need to make sure you TRAIN THEM to be problem solvers and critical thinkers. 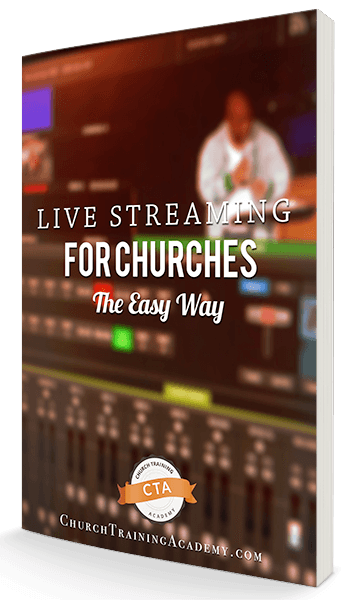 Teach them how to make the live stream look better, route audio, or find blind spots, …and if they fail, encourage them in the failure. Tell them it’s okay! I failed plenty, but I’m still here and I’m better for it! Show your volunteers where they went wrong, and how to fix it. Encourage them to learn from their mistakes. Invest in your volunteers because you won’t be at your church forever. You will get sick or you will move on, and they might be the ones in charge. So they need to learn how to fix problems, and more importantly, how to go about fixing them, I.E. critical thinking. School is not teaching critical thinking. And without critical thinking your volunteers need their hands held. Which means when something goes wrong, they won’t fix it. Or worse, they’ll leave. Listen to any entrepreneur story and you’ll hear about their failure. Every successful entrepreneur has failed in their past. The reason they are successful is because the learned from their mistakes and moved past their failure. Plenty of people try to start their own business. But many fail once and then move on to “normal” careers like accounting or retail. Successful entrepreneurs failed but learned, improved, and tried again. When you ask questions, you get to the root of the problem and help your team be involved in the process of problem solving, thereby learning to critically think. Leader: Why did the lights turn on in the middle of Good Good Father? Volunteer: I bumped the light button. Leader: What can we do to fix that? Leader: Well let’s think about it, why did you bump the button? Volunteer: Because I was reaching for a cable. Leader: Why were you reaching for a cable? Volunteer: Because I didn’t know we needed this hookup for special music. Leader: Why didn’t you know? Volunteer: Because we didn’t know there was special music until the day before. Leader: So what do we need to do to fix that? Volunteer: We need to know what the special music is earlier. Leader: Ok great, let’s fix that and make sure you know who’s playing ahead of time. When you start to teach your volunteers that failure is okay, you’ll see a change in how your ministry performs. The great thing is that our churches tend to lean towards grace…maybe some people are less forgiving, but most will understand that things happen and move on with their lives and come back next Sunday. That’s the great thing about church volunteering, we get another chance next week. With 52 Sundays in a year, your failure may not even be remembered. So when you make a mistake, fall short, or just plain fail, move on. Learn from your mistake, and get comfortable with ministry failure. Jesus let the disciples fail all the time. He let the disciples fight over being first in the Kingdom, fall asleep in the garden, and even let Peter fall into the water after trying to walk on it. Sometimes failure is scary because it can be catastrophic, but again, we operate under grace. In music we have a saying, “good enough for jazz.” It’s a joke playing off the fact that to many, jazz sounds like a bunch of random noise. To the untrained ear, bebop or thick chords can make you think, “how is this music?” So if we’re not sure a note is right, we say, “good enough for jazz” as a joke that it might not be right, but people won’t notice. We shouldn’t do ministry that way. We want to be excellent during service, but also before and after. If the projector goes out, don’t throw your hands up and say “oh well, they’ll understand if there’s no projector for a few weeks.” Instead, do what you can to get the bulb replaced as soon as possible. Overnight shipping, get the ladder out on a Saturday, or borrow a projector and put it on a stand for service, for example. For anything you do, you won’t get it right the first time or be perfect as you continue to do it. You need to be okay with yourself failing. As entrepreneurs ourselves, we expect to fail. We don’t want to, but we know not everything will work out. And instead of doing what we want and shutting down, we ask questions to find out what should be improved or fixed. Make sure your team knows that you don’t expect them to be perfect. Remind them that you want them to do their best job, but it’s okay to fail. And if there are consistent mistakes, it’s not because they are a failure, it may be because they’re in the wrong position. Failure is always an option. And when you do fail, fail fast and move on. This starts with you. If you’re leading your team, make your ministry a safe place to fail and create a culture of teaching through failure. What was your biggest lesson from a ministry failure? Let us know in the comments below!